"Flying Purple People Eater" was an extraterrestrial purple humanivore, notable as a novelty character-actor and singer, who played the part of alien Sheb Wooley in the classic horror song One-eyed One-horned Flying Purple People Eater. The tune was a pop hit in the early 1960s, and was unsuccessfully nominated for a prize. Nevertheless, it played on Broadway for several years, until the entertainer's death in 1964. The creature is buried at Graceland, next to its idol, Elvis Presley, leaving behind a negligible body of recorded talent. 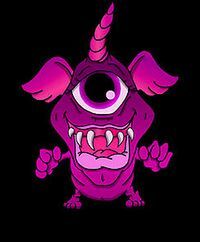 The One-eyed One-horned Flying Purple People Eater was an alien with a single eye and horn who descended on our planet simply to hunt for purple people. And upon entering Earth's rarefied atmosphere the creature also gained the useful ability to fly - which made having wings all the more sensible. The standing hypothesis is that the creature came from a planet of Purple People Eaters who were probably running low on food. The situation became more complex when the beast finally realized there are no purple people on the Earth, other than small children who try to retaliate against their parental figures, and patients suffering from Chronic Obstructive Pulmonary Disease. Being unable to eat much of anything but grapes and plums, while raisins and prunes were a bit too dark for the finicky creature's palate, the Purple People Eater switched its focus to a career in show business. Although no real substitute for purple people, the monster's foray into the entertainment industry was met with a modicum of success when it played a background actor in such television shows as Twilight Zone and The Ed Sullivan Show. The creature also landed the leading role in My Stepdad's a One-eyed One-horned Flying Purple People Eater, in which it portrayed the Stepdad. Later, the alien became a minor pop star, who also appeared on stage, radio and the silver screen. Pablo Picasso's bogus rendition of the Flying Purple People Eater. Although better known to adults, the creature was an extraterrestrial one-eyed one-horned Flying Purple People Eater, who presumably originated from the planet Iilewq, which is believed by those so inclined to orbit both of the Ofoni systems. I said Mr. Purple People Eater, what's your line? He said eating purple people, and it sure is fine. 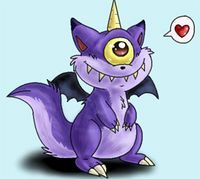 Monsterologist, Don Martin, discussed the character of One-eyed One-horned Flying Purple People Eaters, and he noted a total lack of respect for purple people. "Don’t ask a stupid question." Martin told National Enquirer, “It should be written 'flying purple-people eater' to make clearer the apparent intent that 'purple' refers to the people eaten". The ambiguity of the creature arose during its first run on Broadway: Was it a he or a she or an it? Was it Aye-sexual, Be-sexual, See-sexual, or Try (anything once)-sexual? Was it actually purple or did it eat purple people? In response to the play, viewers drew pictures from memory that show a "people eater" colored purple. A post-mortem examination after it eventually starved to death proved conclusively that the creature was, more or less, purple[Citation not needed at all; thank you very much]. The beast spoke fluent American-English as well as its native tongue, Iilewqi. The voice of the purple people eater is similar to, but not quite as high-pitched or as fast, as Pee Wee Herman. The creature had a hit with its first recording, “Dr. Dr.”, followed by another hit, “I Can’t Get No Satisfaction” (later covered by the Rolling Stones), which was released late in 1958. Later, the creature, disguised as Sheb Wolley, released the hit, "Purple People Eater”, which finally made the creature infamous. Apart from television and radio, the purple people eater appeared on the big screen in, "The Purple People Eater Meets the Witch Doctor", by John Huston, and also released a B movie with no name in 1960; it was almost featured in, “The Big Bopper” in 1961, a film which was never actually even contemplated. In spite of taking singing lessons from young Bob Dylan, the creature was unable to impress Mario Lanza, who failed to appreciate the unique sound of baritone being sung in falsetto by a hideous grape juice thirsty abomination. In August 1964 the creature finally died of starvation in New York City Jail, after being charged with impersonating a Purple People Eater. Unfortunately the creature had no identification to prove its innocence. The enduring popularity of the creature led to the Minnesota Vikings changing their name to "Purple People Eaters" in 1970. Boyz Will Be Boyz mentioned the beast on their 2004 album, Kidz Pop Halloween Bubble. The Sheb Wooley version reached #4 on Billboard. ↑ "A Wild Guess Gazette", 11/18, Fox Broadcasting. ↑ The Purple People Eaters. Bob Lurtsema's Viking Update. ↑ The Incomparable Judy Garland. If it is on the Internet it must be true. ↑ Are YOU still reading this nonsense? You should be committed - seriously! 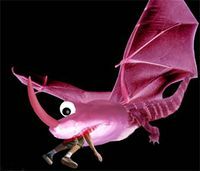 For the religious among us who choose to believe lies, the "questionable parody" of this website called Wikipedia think they have an article very remotely related to Flying Purple People Eater. This page was last edited on 25 November 2014, at 09:03.